In new mutlifamily urban housing in Los Angeles, developers are building bigger kitchens and leaving out formal dining rooms. In other words, the kitchen, dining room, and living room are morphing into one large room. 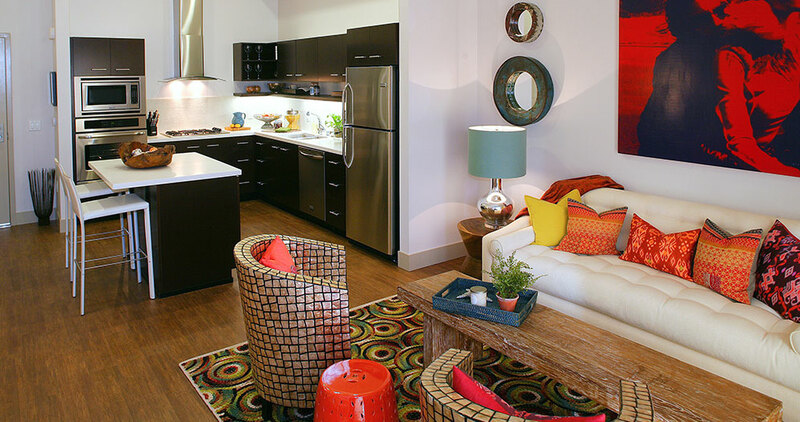 The new Archstone Apartments in Venice (Los Angeles, California), feature knockout open kitchens. The kitchen forms the center piece of one great room for living, dining, and food preparation. A breakfast bar area provides the only place in the apartment for sit down dining. One bedroom apartments featuring this 1,000 square foot floor plan start at $4,000– a hefty price to pay for the changing layout of urban living. With the evolution of Gen Y’s preferences regarding living spaces, separate rooms for entertaining, dining, and living are no longer needed. PMI will feature these designs in their new, creative multifamily projects. There has been an alarming increase in lenders demanding debt service coverage ratios, and/or the right to demand loan pay downs if a property’s appraised valued declines. This is also called” re-margining.” If an owner’s cash flow or property’s value declines beyond a certain point, lenders want the right to require owners to make forced pay downs on their loans or post additional security. These pay downs will likely come at a time when the owner is unable to obtain alternative financing and when his cash resources will already be strained by falling occupancy as well as rents and increases in tenant improvement and leasing costs. This is similar to forcing a homeowner to pay down his loan if he loses his job. The lender’s right to require pay downs can occur even if the owner is current on all his loan payments and obligations. Such a provision demands even lower leverage and outsized capital reserves from a conservative investor. Where will the equity for a loan pay down come from? Office values are extremely volatile and have exhibited declines ranging from 40% to 70% during recession periods. Defaults and foreclosures will only multiply if banks require owners to make loan pay downs during a recession. Conservative investors should resist such clauses.